Its a pleasure to read your review, it makes us so happy and proud of what we are doing is right. Very comfortable & in great location! My daughter and I spent two nights in this nice Guest House. We each had very good bedrooms overlooking the river and mountain.Also, had two lovely breakfasts and dinners. But the high spot - on the second night - was to see the (Category 5) Northern Lights. Quite amazing and right across the sky. So lucky, but no light pollution. This is a lovely guest house. Very cold, but unforgettable experience. Thank you for your review, so nice of you for taking your time. Great that you saw the northern lights, yes you were lucky. 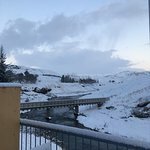 but you’re in Iceland - why would you want to just stay in your room? The restaurant was very nice for dinner and breakfast (breakfast was included). The view from the hot tubs of the river and the fuming mountains is fantastic. Enjoy! Thank you very much for your review, it means a lot to us. We stayed at this hotel for 2 nights in January and absolutely loved our stay. 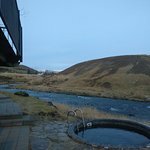 The hotel is located in a ravine, which separates it from the little town Hveragerthi and allows you to feel alone with nature. 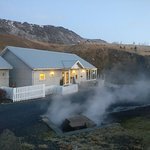 The hot spring powered jacuzzi and sauna facilities are immaculately clean and perfect for relaxing after a day out exploring.The hotel is located in a geothermal area, offering a number of scenic hike options just outside your door. Varma Restaurant located on the hotel property offers generous portions of perfectly cooked Icelandic delicacies. You can cook an egg over a hot spring at breakfast, a must do when vising the property! The reason I gave Frost & Fire 4/5 instead of 5/5 is that they were having issues with hot water supply during our stay, making it difficult to enjoy nice hot showers. Room tip: Request a room with the view of the river! Thank you for your nice and warm review about us and our hotel. Yes we had accident with our hot water last week but its fixed now. Im so sorry you that you needed to be witness of this and be suffering. 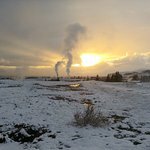 I really hope you enjoyed your stay in Iceland and Frost and Fire hotel wish you all the best. Frost and Fire is a small hotel in a remote location which gives it a private and cozy feel. 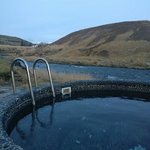 There are two natural baths, a pool and sauna room right on the hotel grounds which back on to a river - the surrounding grounds are the best feature of Frost and Fire. The rooms are relatively basic and could do with an update (e.g. fresh paint) but are clean and comfortable. Checking in and out was easy and the staff at reception and in the restaurant were friendly. Parking was available right outside the hotel. We stayed for New Years Eve and the restaurant offered a buffet on this night. The food was good but I don't think the buffet did the restaurant justice given other reviews I've read, although the breakfast the next morning was delicious. 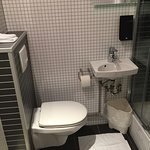 Lovely location and staff, but take a standard room not budget. Staff very friendly, and an excellent setting. Pool and hot tubs look great, although we didn't have time to try them out. Plenty of on-site parking. Unfortunately the 'budget' room we stayed in had a very cramped bathroom, and we were kept awake by people outside in the hot tubs (which are open until midnight). Some aspects of the room were a bit tired, e.g. desk worn and chipped, and skirting board not affixed to the wall. Other family members were in 'standard' rooms which were much nicer, and the cost differential is so small that I would advise just paying the higher rate. The budget rooms would be acceptable if priced a little lower, but felt expensive compared to other rooms we stayed in on the same trip (e.g. four-star room for exactly the same per-night cost). Room tip: Avoid rooms near hot tub. Definitely pay for a 'standard' room, not 'budget'.